integrated PT1000 probe - for use in cryogenic vessels. 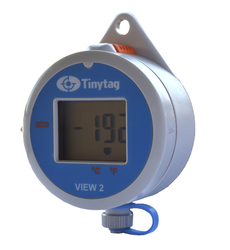 Specialist ultra low temperature data logger with an integrated PT1000 probe (252 mm length, 3mm diameter) to use with a variety of cryogenic vessels. Housed in a splashproof IP65 case, the unit can be mounted to the flask's lid with the probe inserted through an insulating plug into the tank. It has a digital display of current readings and user programmable alarms that will trigger visual warnings when limits have been exceeded during transit.